In 1906, a magnitude 7.9 earthquake struck San Francisco, destroying much of the city and killing as many as 3,000 people, making it one of the deadliest earthquakes in history. But it also gave birth to modern American earthquake science. Now, researchers are trying to understand the quake using cutting-edge techniques—and some old documents. This might sound like meager information with which to reconstruct an earthquake, but it provides more data than you might think. 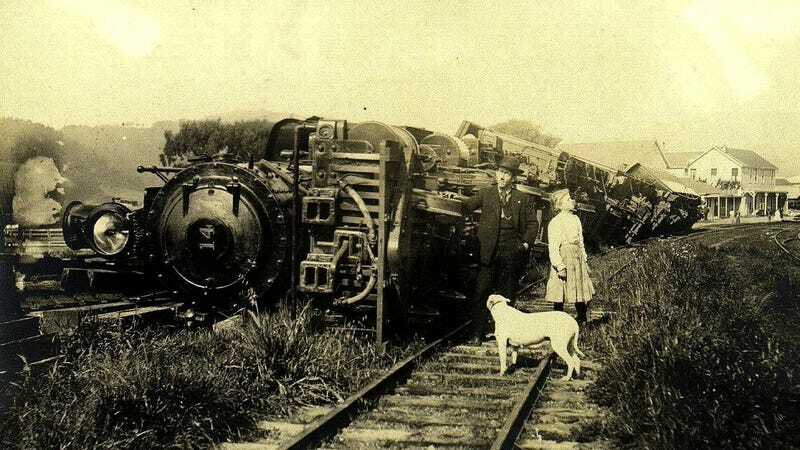 The quake must have been powerful enough to cause the rocking and the tipping of the train. The team simplified the train’s measurements into a long rectangular prism, and simplified the quake to an up-and-down wave motion of the ground. They then used equations devised to describe a rocking rectangular block in response to ground motion to calculate how big the wave must have been in order to tip the train. On top of their analysis of the train tipping, the researchers were able to estimate the location of the earthquake’s hypocenter—the area where it actually occurred in the Earth below the epicenter on the surface—based on the train’s location and behavior. While previous models have suggested three locations for a hypocenter, this result reveals that only a hypocenter to the south of Point Reyes, California, would recreate the eastward, then westward tipping of the train, according to the paper published in Seismological Research Letters. This leaves a hypocenter offshore from San Francisco or near the California city of San Juan Bautista, confirming previous estimates. The paper comes with uncertainties—for example, the researchers didn’t know how much the train weighed, and are using a simplified model to understand what went on.